1923 It was decided to build the hall on the land where Pen Rhiw cottage and ruins stood and to call it Neuadd Goffa Mynydd Llandegai. No definite decision was made regarding the size of the building but costs were to be kept to between £600-800 and would hold between 400 – 700 people. The Reverend William Morgan negotiated with the Penrhyn Estate for the land. A request for more land was made in order to have an area of lawn, but the present tenant was unwilling to give up more land than was necessary for the building. The committeemen went to mark out the plan on the ground. A working committee was formed to draw up a schedule of work which could be followed by the able bodied men. Permission was given by Mrs. Roberts, Cefn yr Ynys to store slate and other building materials there. 1928 Committee met the architect on site and looked at specifications. Unfortunately no record of minutes is available from 1928 until 1933. From the memories of the present senior citizens of the village, the men of the village built the hall. Stone was carried from the mountain as they came from work in the evening. Meetings were held regularly with money being raised to pay for everything. The villagers doing all the work they possibly could. 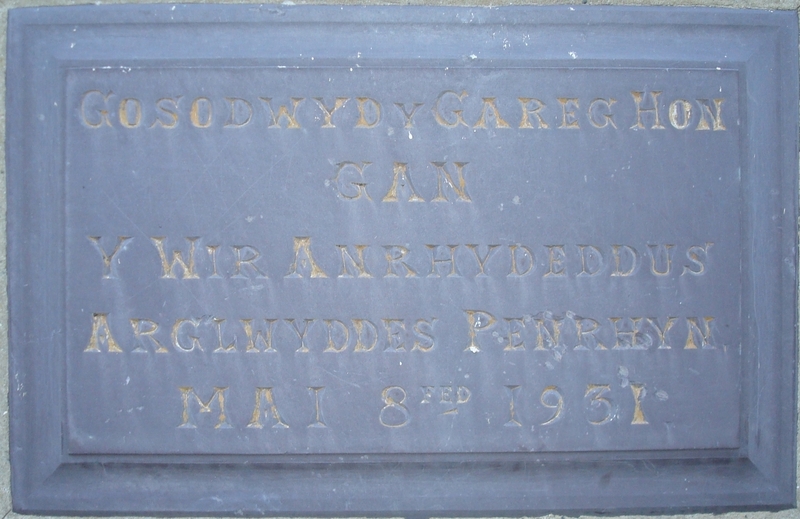 1931 Lady Penrhyn laid the foundation stone. 1933 The main building had been built as the minutes state that the Billiard Room is up and running. Blinds placed on the Billiard Room windows. The lavatories were not quite ready. Windows and doors were painted. Skylight to be erected in the kitchen. Picture rail in Billiard room and Hall. Wood for hooks to be erected in billiard room. A boiler was to be bought for the kitchen holding 30 gallons. A coal box and shovel for billiard room. Boiler and grate to be put in for 25/-. Stonemason given the job of concreting around the hall as shown on the plan on condition that a local person is taken on to help him. Secretary to be in charge of the water pipes in the anteroom and an outside tap for the use of the kitchen. Dado rails were painted, as were the kitchen and lavatory doors. Mr. William Jones, Bwlch prepared the drains for the water pipes. A meeting was called to meet the guarantors in order to get permission to spend more of the borrowed money. Two grates put over the gullies of the drains. Curtains, blinds and fittings on all the hall windows. Tar and chippings to be laid up to the entrance of the hall. Erection of memorial plaque. Tables, steps to stage and notice board for billiard room made in locality. Suffolk latches put on latrine doors. Lavatory buckets bought. Doors, down spouts etc. were painted/varnished. R T Jones gave a cabinet to house the wireless set given by Dr. Pritchard Bethesda. Committee gave a clock to be placed in billiard room. Billiard table was brought in. An experienced man was employed to put the cushion on the table so that no blame could be placed on the committee if the work was not up to standard. Mr. Ashcroft, Liverpool did the work on the second billiard table for 35/- and put new cushions on the first table for £12. 1934 Gate erected. Glass in the kitchen window. In order to extinguish fires and to be in line with county regulations, six buckets were bought to hang on the wall, plus brackets. Around the Hall was tidied up for the visit of the Prince of Wales plus painting the place. Permission was given to take turf from the mountain so that it could be laid around the Hall. A piano was bought and a cover made for it. Mr. Rowland Pritchard donated ornamental trees. A Women’s Institute was formed by the women of Mynydd Llandegai (June 11th 1934) with Lady Penrhyn agreeing to be President. Windows and doors were made. Six windows were to be made for the Billiard room, with bars on the two gables end ones. Grate in the kitchen was taken out and re done. Songbooks bought for the Hall. The anteroom next to the kitchen was turned into a library. Wire netting to be erected around the Hall to stop the sheep getting in. Curtains made for the stage. Cupboards put in the library. The above information has been taken from the Neuadd Goffa’s first minute book.